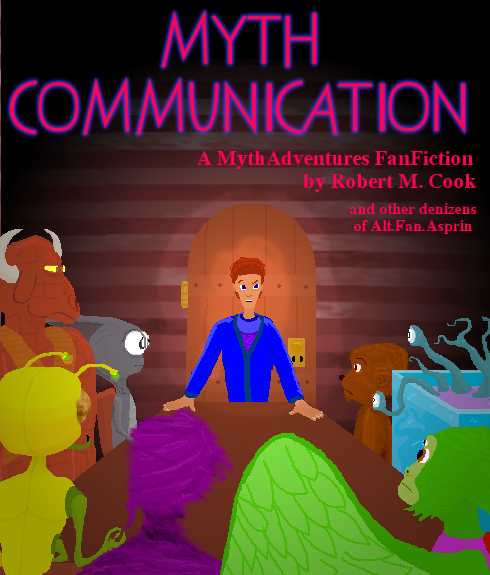 Long ago and far away, some of us at alt.fan.asprin were writing a round-robin collaborative fan-fic piece, based on Robert Lynn Asprin's then-defunct 'Mythadventure' fantasy/comedy novels. 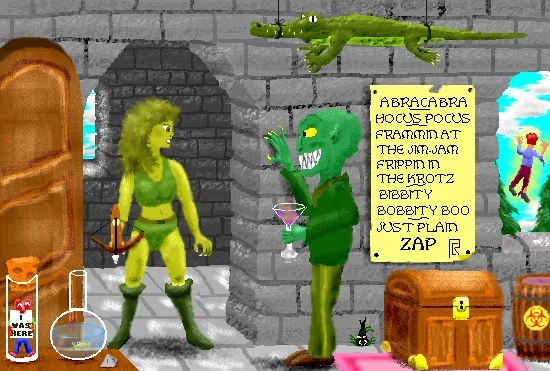 If you don't know who Robert Lynn Asprin is, go check out my handy-dandy FAQ page. I contributed some chapters to this story, and, doing my best Phil Foglio imitation, also drew a picture for each chapter. The fan-fic eventually trailed off and died. I decided this wasn't acceptable, and wrote an epic multi-chapter ending on my own. This story takes place after Mything Persons, and spins off from there into a alternate timeline from the official books, particularly when my chapters get going. Certain background details are different from the orginal stories as well. Below you will find the original 13 chapters of the story, my 13 drawings for those chapters, and my ending, which I called 'Myth Communication'. There are no drawings for the 'new' chapters, but who knows; maybe some decade I will get inspired and ambitious. If you don't like the ending I wrote, write your own and post it. If you want remember the original story as it ended with the 13 chapters, don't read my ending. If you have moral and/or legal objections to the concept of fan-fiction, please leave now. If any lawyer-types in positions of authority ever come after me for posting this stuff, it'll be yanked so fast it'll make your head spin, so enjoy it while you can. Before posting the original chapters, I did do a spot of grammar and spelling correction, even to the extent of adding a single line here and there to clear up the narrative flow. However, no new plot has been added, and several minor contradictions and inconsistancies remain, as a token of the fact that several authors worked on this thing. I came up with an opening quote for each of the four original chapters which didn't have one. IF YOUR WORK APPEARS HERE AND YOU DO NOT WISH IT TO, PLEASE CONTACT ME AND I WILL REMOVE IT. IF I HAVE MISIDENTIFIED ANY OF THE AUTHORS, PLEASE CONTACT ME AND I WILL CORRECT IT. Also... another a.f.a. denizen wrote a short Myth story called 'The Naked Truth', and posted it to the group. Here is the picture I drew for this story. If you want to read the story all in one fell swoop, you have two options..
.txt version. Just the text, which can be read either with your internet browser, or with something like Windows Notepad or Wordpad. original chapters and my chapters. .pdf file. Thanks to the generous efforts of a site visitor, this copy of the complete story has been assembled to look as much as possible like an official Starblaze-era print-and-ink MythAdventure novel, with my illustations included. You can either read it as-is, or print out the pages and make an actual book out of them. Presumably you know this, but just in case.. you'll need a pdf-reader. I personally recommend Foxit; it works well and it's free! And here's a cover I drew up if you should want it. All MythAdventure characters, concepts, titles, etc. � the Estate of Robert Lynn Asprin. All original chapters � 1998 their respective authors. Anything left over after that is � 2000 Robert M. Cook. Drawings created with JASC's Paint Shop Pro.